Thank you to everyone who participated in the #pfhtblog giveaway! I’m so glad to have so much support and feedback from everyone. Winners will be announced next week so stay tuned! Tomato soup is one of those things that I learned to appreciate more as I grew up. I used to find it sour and acidic, far from the childhood sweetness my younger self craved. 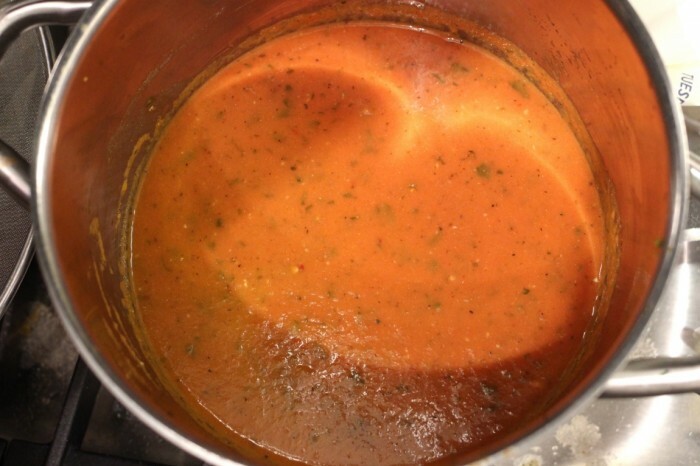 But now that my adult palate has set in (and now that I’m more conscious about what I put in my body), I can honestly say that I love a good tomato soup–it’s wholesome, light, and packed with fresh flavors; it’s hard not to find it appealing! I’ve always struggled with the idea of cream. Yes, it’s delicious, but it detracts from the benefits of cooking something so healthy. :( But in the advent of healthy substitutions, there’s no need to fear! Greek yogurt offers the same creaminess as cream or sour cream in many baked goods and cooked dishes without the guilt and lipids that accompany it. I added a touch of sugar to offset the sour bite and what you get is a deliciously light and creamy soup! Besides, this makes getting the strangely addicting cheese straws from Breads Bakery in Union Square all the more justifiable! (If you’re in NY or find yourself here for a visit, I highly encourage you to try one for yourself and see what I mean!). As always, thanks for dropping by! Here’s to happy and healthy eating (with some cheats here and there, as you all know I have many weaknesses… cough, dessert). Also, check out my new Instagram account! 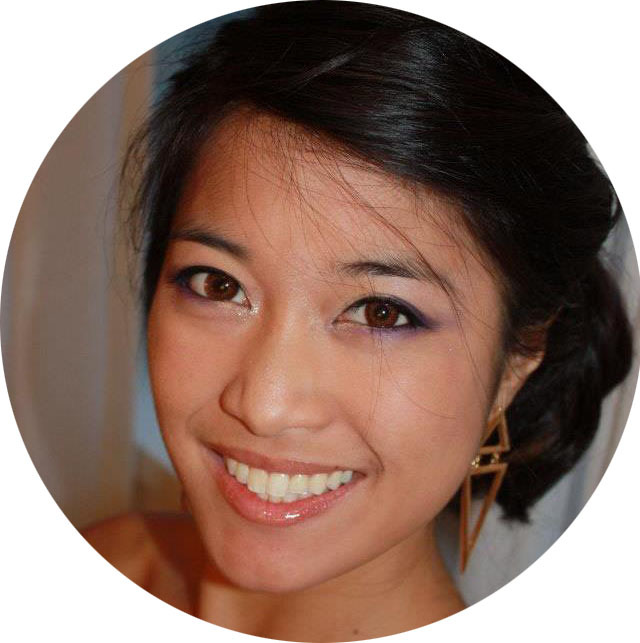 Find and follow me @pfhtblog! 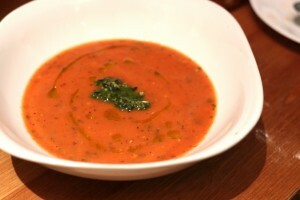 A fragrant and flavorful tomato soup that's light and creamy; simmered with fresh basil and parsley with featuring Greek yogurt to cut the calories! Goes well with spoonful of pesto and a drizzle of olive oil. In a large pot, heat olive oil over medium-low and brown the garlic, onions, and mix in with bay leaves. 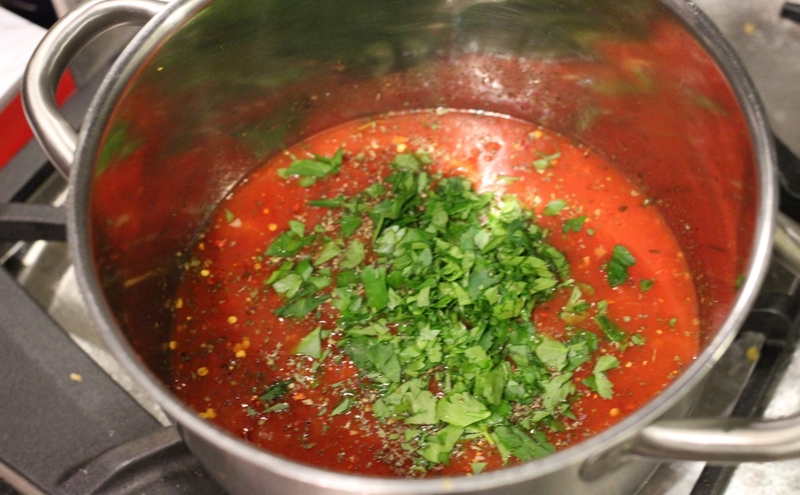 Add in canned tomatoes, low-sodium broth, basil, parsley, oregano, red pepper flakes, sugar, salt, and pepper to the pot and simmer for 15 minutes, adjust heat as needed. Remove from heat to cool, and remove bay leaves (they're difficult to ingest). 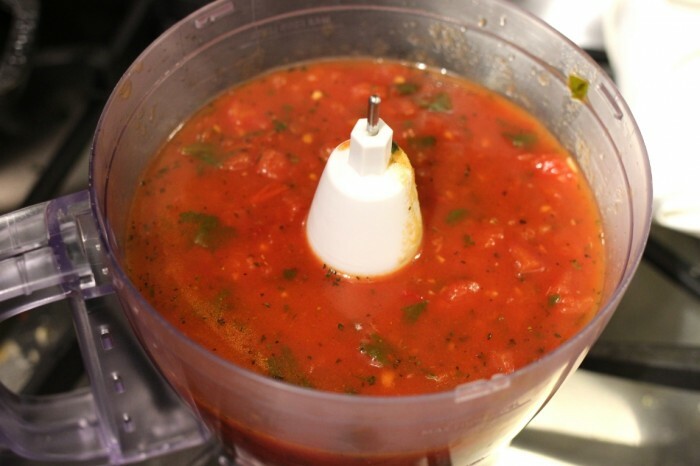 Using an immersion blender or food processor, blend the soup (careful, it may still be hot!) until smooth, about 2 minutes. Stir yogurt into blended soup and mix until well incorporated. Serve and enjoy while still warm! I like to add in a scoop of homemade pesto (recipe coming soon!) and a drizzle of olive oil to each serving. Oh so good, and oh so light!